When I was 11 I got my first electric guitar, 15W Crate practice amp, and Boss OD-2r overdrive pedal. When I wasn't practicing what I was supposed to be working on I would rock out by kicking the OD-2r into Turbo mode, crank the gain, and ALSO turn the distortion on the amp up to 10. It was great, nothing sounded bad because it all sounded the same... like distortion. But then again nothing sounded good because it was all indistinguishable. At the time, though, I thought it sounded great! You couldn't tell if I was shredding or just hitting random notes as fast as I could. I was hiding behind the effect. Or some sort of variation on that. Changing from 477 to 457 to 447 is a little awkward for me, I use my pinky to play the b and e string on the 7th fret then switch back to using my middle finger to play the b string and my pinky to play the e string. Switching between the two positions means I can't leave the e string ringing and the notes get chopped a little. My first reaction was to put an eighth note delay over the top so the delayed notes will hit on top of the notes I'm playing and hide my rusty switches. Why is that my first thought? I use this form a lot and it would be much more worth-while to spend an hour practicing the switch until it was clean than rely on effects to fix it. I have a sneaking suspicion that worship guitarists use delay as a masking tool more than we should. Don't get me wrong, I love delay and when used right, will add a thick texture to our sound. I do, however, think it's temping to let delay wash out our playing and like my early distortion, cause everything to sound the same... like delay. I guess in practice, we should never NEED an effect. Anything we play should sound good played through a clean, effectless, amp. 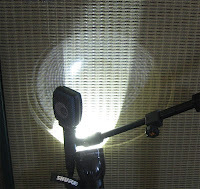 From there we can add effects to change the atmosphere and tone, but effects should never be used to hide bad playing. The "don't leave home without em's"
-Extra FULL set of strings - if you bring a pack that's missing a d-string, your d-string will break. That's how it works. -20' Extention cord - I end up needing it 90% of the time. -Screw driver - my strap locks used to come loose until I gorilla glued them in. I've also used it to change the string intonation. Never know when somethings coming unscrewed. What emergency stuff do you take with to every gig? Savage Audio - About 5 mi. from my house there's an indoor go-kart track. On the back side of the building there's a shop that builds amps and repairs vintage gear. I take my amp there to get the tubes biased. 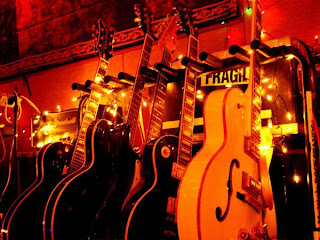 Oh, and a few musicians have used their amps - Beck, Tom Waits, Pearl Jam, Foo Fighters, Sheryl Crow, Counting Crows, R.E.M., and Wilco to name a few. Z.Vex - I first saw one of their pedals at a Music-Go-Round (second hand music gear), it was the Wah probe and it looked crazy. They guy at the stored explained it to me and it's a really cool idea. 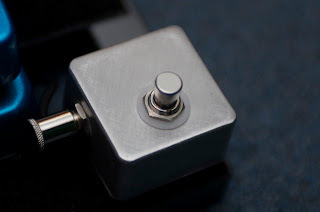 There's a charged metal plate and the closer your foot gets to it, the higher the envelope filter. Check out the video on their site, the thing is nuts! And they hand paint their effects! In the previous post I listed Micheal Guy Chislett's gear, he has their Fuzz Probe and Super Hard On. Crazy that a guy in Australia uses gear from Minneapolis. Van Amps - Who makes the absolute best analog spring reverb pedal? There's some debate, but the usual winner is either Fender or Minneapolis' own Van Amps Reverbamate. I recently got the Van Amps Sole-Mate (the single output version of the Reverbamate) and it sound fantastic!! Minneapolis also has a slue of great vintage guitar/amps/effects shops and I can't forget to mention Slammhammer Cases, the road case builder that made my custom head case. They even made room for my power cable that doesn't unplug because it was converted from British to US power. Thanks guys! Not sure what brand, but it's an effect loop contoller (update: I heard it's by "Loooper"). Each pedal is in it's own true bypass loop and it turned on and off by the switch on this controller. There's a little blue pill box or something above the fuzz probe?? The DD-5 has a cable plugged into the tap tempo but I can't figure out what it's connected to. What is the gray box in the top corner? The Super Hard-on is connected to it by input AND output. It almost looks like the DD-5 and DM-2's outputs are sent to it as well. Either the Blue Box isn't plugged into the effect loop box on the bottom. How much pizazz can worship music handle? This is a picture of me when I was playing with Left on Farwell (thanks for the picture Jordan!). I would never look like this during worship though. 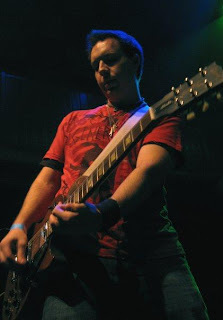 In fact, when I started playing in bands (non-worship) after ONLY playing in worship bands for years, it was really awkward for me to be on stage. In worship we have the mentality that we should be invisible and non-distracting so we mostly look down at our strings and try not to move. In live music, in a non-worship settings, the goal is to captivate, visually emphasise the music, and entertain. I slowly got the hang of it until it was totally natural. At the time I was taking a break from playing on worship teams so when I came back to worship, it was awkward again. It had become natural for me to move around to visually emphasize my playing, but I felt like I should hold back. Obviously there are extreme black and whites. On one hand we could have the worship team (piano and singers) play from the back of the church, play really conservatively, leave the lights off, and only put white lyrics on a black background. There would be nothing distracting and nothing visual. On the other hand we could have a laser show where the bassist back flips off the drum riser in perfect coordination with the pyrotechnics and the electric player shreds a solo from a harness floating over the audience. I think we lean way more toward the first. Actually, the first one would be just fine for certain aspect of worship, but I think the second is so entertainment based and visually loud that it would be hard to see God in anything. Most churches are somewhere in between. If the point of worship was just to sing, we would only need a melody, but we add chords, and rhythms, and counter melodies. Are those distractions? We're all playing them, so we must not find it to be distracting. Instead, we find it adds to the experience. It creates emotion and helps people connect with God. The same is true with visuals. All the congregation needs is lyrics but churches put the worship team up front, an interesting background on the lyrics screen and a lighting system. It's obvious from these practices that churches feel visuals will help the congregation worship. The visuals can craft emotion just as well as music. Ever seen someone dance as worship? It's harder for us to connect with because music is a bigger part of our culture, but the Psalms tell us to dance, clap, and jump along with telling us to sing. Dance can be worship. I guess I'm back to the original question, but this time asking, how can my movement on stage add to the worship experience? Here's where I draw from what I learn in non-worship bands - the ability to move with the song. If the song is reflective and slow, then I'll be still. That's a visual in it's self and it would be wrong to project that same visual in a fast celebratory song. I'm not going to throw my leg up on a monitor and strike a "Creed" pose, but if the song is exciting I'm going to move around with it. I think the most important thing is to let what's happening on the inside show on the outside. If you're playing the song on guitar, you're feeling some soft of emotion (if you're not you're playing is going to sound bland). We're already making an emotion, the key is just to let it show visually too. I know I used to think there was something wrong with showing anything visually in worship. It's time to get rid of that mentality. 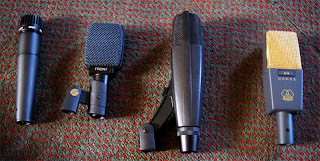 From left to right: The trusty Shure SM-57, Sennheiser e906, Sennheiser MD421, AKG 414. Here's the background on how I set up the test: I recorded 4 licks with effects strait into protools via a Focusrite ISA428. When I say strait into, I mean I skipped the amp and sent the output from the last effect into the "inst in" on the focursite. Recording a guitar sounds terrible like this, but it allowed me to send what I had recorded back to my amp using a Radial Xamp to send my amp a signal it "should" be happy with. Setting it up that way let me record each mike with the exact same guitar line so there won't be any variables in how loud I played or minor differences in style. I recorded each mike 6 times, aimed strait at the speaker in the center, edge, and in between, then angled 30 degrees at the center, edge, and inbetween. When I had all the mikes recorded I listened for which position I liked best for each mike, then compared each mike (at my favorite position) to each other. Quirks: The process went smooth, but recording dry, then reamping had it's issues. All the ohm changes ended up making a lot of noise in the signal... I guarantee my amp doesn't have all the hiss when I play normal. I also didn't give enough volume back to the amp (I was afraid of hurting it) which was safe, but made the amp sound worse because the signal was too low. I ended up not overdriving the preamp tubes or power amp tubes enough so the tone sounds more brittle and buzzy than it does when I play normal and give the input a good signal. All that aside, my tone sounds cruddier than usual but it was consistent for the test and did the trick. Thoughts: This was the most mellow of the mikes I tested. The highs weren't very clear and I had to put it in the brightest part of the speaker to get it sounding clear enough. That said, it sounds as good as the rest once it's there. It's an economical way to get almost the same sound as the other mikes that cost 2-4 times more. Thoughts: This has been my favorite for a while and after the test, still is. Where the sm57 only had one place that sounded good, the 906 had three that were a close tie. It's designed just for guitar cabs so it sounded pretty consistent no matter where I put it. One note, DON'T get the younger brother, the 609. It's cheaper but sounds terrible. Thoughts: This is one of the best tom (drumeset) mikes there is. Some people use them as dynamic vocal mikes, (the Mars Volta for example) and I've seen them on some guitar cabs. I found it had a natural scoop (emphasised the highs and lows) which made it hard to place on the cab. It really emphasised the highs or lows depending on how close to the center I put it. I was able to get a pretty good sound from it, but not significantly better then the 906 or 57. Basically, it will work, but it's not worth the price. Keep it on the toms. Thoughts: I just threw this in for fun but it's not really comparable with the other three mikes. This is a large diaphragm condenser and will behave much differently. I tried it in a regular cardioid response (like the other mikes, it mostly picks up sounds strait ahead) and as a figure 8 (picks up sound from the front and the back but not the sides). I liked it better as a figure 8, it gave a really open and natural sound. The only problem is it has to sit a few feet back from the amp and will pick up ANY noise in the room. It's great for recording when you're already in a room that's meant to sound great, but if your cab is on stage or in a room just off stage, I imagine it will sound pretty bad. The noise is pretty bad on this recording, again, that's because of how I set up the recording, it's no where near that bad normally. If I were in the studio and didn't have to worry about noise, I could use the e906 up close and the 414 a few feet back and combine the two. Here's an audio sample of what that would sound like: WAV (8.8 MB)<-- or Flac (3.3 MB)-->. You just have to be careful of phase cancellation... I'm getting a little in this mix but it's nothing terrible. I found that WHERE the mike was placed made a much bigger difference than WHICH mike I used. I found it easiest to get a good sound out of the e906 and would recommend either that or the sm57. More importantly than which mike you get or use, make sure you find time to experiment with mike placement and find what works best for your cab. Happy miking! 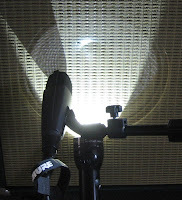 The very last step in your signal change - that you can control - is the mike and it's placement on your cab. This last step can really change your tone and shouldn't be overlooked or left to the sound guy. No offense to sounds guys! But there's no absolute rule on where to put a mike on a cab so when they mike it they're just guessing. 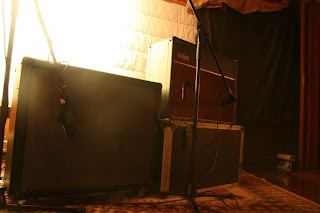 Each cab will sound different so even if you and I use the same mike, it won't sound the same and might sound terrible if you place it the same as I do. The only way to know where to put the mike is by trial and error. I literally bring my own mike to every gig and set it up myself. I'm always careful not to insult the sound guy by doing it myself, but in my experience the good one's don't mind at all. If you're planning on buying a mike you should see if you can borrow a few and see how they sound on your cab first. If you're not going to buy one try to borrow a Shure SM57 (since that's what almost everyone will put on your cab if you don't bring your own) and find where it sounds best on your cab. Ideally you'll be able to make a recording with the mike in a bunch of different positions to hear where it sounds best. If that's not possible, see if your church's sound guy will let you come to practice early and experiment with mike placement. - Aiming the mike at the center of the speaker will give you a bright (lots of treble) sound, the edge of the speaker will give you a dull (lots of bass) sound, you'll most likely want to be somewhere in the middle of those two. - Moving the mike toward the floor will add more bass (reflecting off the floor), moving the mike higher will not add bass. 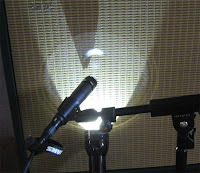 - Aiming the mike strait at the speaker will give more bass than angling it 30-45 degrees to the side. In my opinion, angling the mike also gets ride of shrill high frequencies. Go experiment if you haven't already. Find the best placement and make sure the mike ends up in the best position each time you play! If you have three or more pedals and aren't using a pedal board, it's probably time to get one. It saves a lot of time setting up/taking down, cables will stay in better shape, and your pedals won't move around at all when you step/stomp/tap on them. 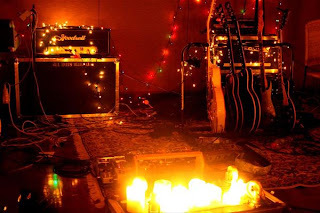 1) Lay out your pedals and the ground how you want them on your pedal board and measure the width and depth. Add 4" to the width for handles and 2" to the depth because you'll end up with power cables and patch cables that take up room. It's a good idea to leave extra room for growth if you plan on adding more pedals. Here is my original layout. In retrospect I had the pedals way to spread out and could have made the board about half the size. The good thing is, I was able to upgrade and expand over the years and still use the same pedal board. 4) Screw the rubber feet to the bottom of the board. Put them on the corners and in the middle. This will make sure your board doesn't slide around on carpet or hard floors. 5) Screw the handles on the far left and right. 6) Velcro your pedals down. Make sure you are consistent in what part you put on the pedal and what part you put on the board so you can swap pedals if you need. The standard way of doing it is to put the fuzzy side on the board but I happened to do it opposite. 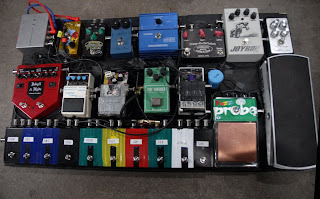 If you have a second row of pedals (like I do in the current photo) you might want to raise up the back row. 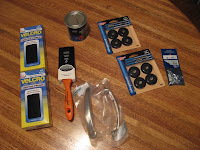 I bought a piece of 3/4" MDF, painted it black, screwed it on using 1" screws, then Velcro'ed the pedals down. I made it a lot easier to step on that row. If you want a way to carry your board around, look for a keyboard gig bag that will fit your board. I was able to get one for $30 and it's been all I've needed so far.